Moving day may be a big upheaval for you, but it is routine business for us. Let Artisan Movers help your family get ready to go have new adventures in a new home as painlessly as possible. Let’s get started with some good advice on how to properly prepare so as to reduce the possibility of breakage during the move. Decide where you will do your packing. You need an open, spacious area, preferably with a good table or work surface. Only use your dining room table if you are prepared to have it get scratched up. Put together supplies beforehand. In addition to boxes and packing papers, you will need markers, tape, scissors and labels. Lay it out for convenient access while working. Be methodical. It can help to pack one room at a time and carefully label everything. If you start well before your moving day and pack a box or two a day, you should be able to comfortably finish the job. Have a labeling system. It can help to color-code boxes by room. Make a log sheet that tells you what is in each box, how many boxes were packed for each room and the total number of boxes. Pro Tip: Do not identify valuables by writing “gold jewelry” or similar on the outside of the box. All that does it make it easy for thieves to clean you out. Remember: Safety first. A good rule of thumb: When in doubt, add more packing paper. The most common cause of breakage is inadequate or improper packing. Make sure the box will properly hold everything. It helps to keep the weight under 50 pounds, but you should also make sure that the bottom of the box is properly secured before you begin. Additionally, pack heavy items first and put lighter items on top. Small: Small heavy items, such as books, magazines, photo albums, and small hand tools. Medium: Heavy items, such as small kitchen appliances or shoes. Or delicate items, like hats, collectibles et al. There are also specialty boxes available for hard to move items, such as a dish pack box (aka china barrel), flat screen TV box, mirror box, wardrobe box and mattress box. Dish packs are good for all kinds of small, fragile items, not just dishes. Mattress boxes can be found in all bed sizes, from twin to king. Our staff at Artisan Movers can also make custom boxes and crates for specialty items. If you are unsure how to estimate what materials to buy, we can help you come up with an estimate. Cutting tools, such as scissors or a box cutter. Second-hand boxes, such as store discards, may not be clean and may not be sound anymore. Only use boxes that are both clean and in good shape. When in doubt, buy new to make sure your belongings arrive undamaged. Old newspapers are a popular substitute for packing paper. But be forewarned: This can stain items. Also, if anyone in the house is immuno-compromised, this option may not be adequately clean and germ-free for you family’s needs. If you pack your own, then hire Artisan Movers to move you, we will inspect everything to make sure it is packed properly. If it isn’t done right, we will let you know which items need to be repacked before we can move it. For many people, the kitchen is one of the hardest rooms to pack. Here are some tips on how to safely, effectively pack common items with confidence. Set up as many medium sized boxes as you think you will need for this packing session. Start by lining the bottom with crumpled packing paper. Start with the large plates. Set them next to your stack of packing paper. One by one, set each onto the stack and fold paper over each one until it is completely covered. You should be able to stack up to three or four plates, possibly more, wrapping them into a bundle. Do not make your stacks too high. When you are done, the height of the stack should be half or less its width. Double wrap it by turning it over and wrapping the outside from the other direction. If the plates are not fragile, you may be able to bundle up to six of them. Tape it up and then put it in the box. It is best to stand your plates on edge in the box instead of laying them flat like you would normally store them in your kitchen cabinets. Place a single cup, right-side up, six to eight inches from one corner of your packing paper. Cover it with the nearest cover. Stack another identical or similar cup on top, nesting them together with paper between them. One at a time, pull two more corners into the new cup. Roll up in the remaining packing paper. You shouldn’t stack more than two together. Put them in the box upside down. Cups should be close to the top of the box. Do not stack anything heavy on top of them. Delicate items should be stuffed beforehand to reduce the risk of breakage. This includes delicate glasses and stemware, but is a tip that generalizes to other delicate, hollow items that may be found in other rooms. Lay the item down on its side and roll it up. Depending on the size of the item, the paper may wrap around it once or twice before you need to pull the sides in, then continue rolling. For added protection of especially delicate items, you can use corrugated paper. Glasses and stemware belong near the top of the box. 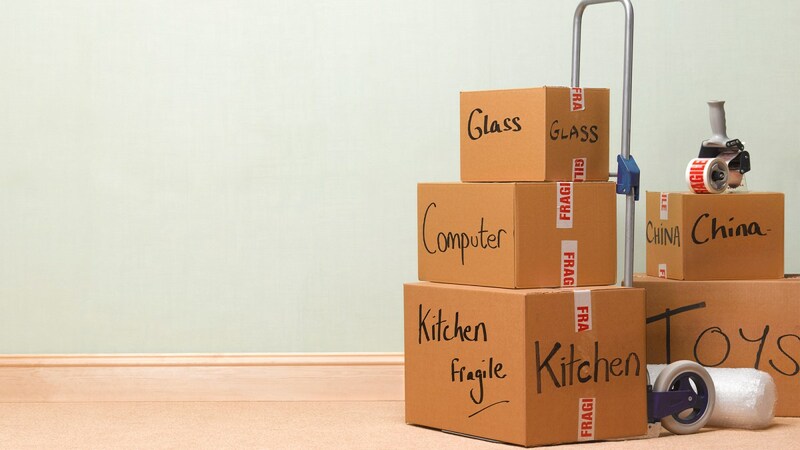 Heavier items that are less fragile should be below them. This can include dinner plats, pitches, etc. Place them in the box upside down. Never lay them on their side. Fill gaps with crumpled packing paper as you go. Boxes with fragile items, like stemware, should be clearly labeled as Fragile. Some items can be especially nerve-wracking to pack. They are typically heavy, bulky, oddly shaped and/or just require some kind of special attention to make sure they don’t get damaged during the move. This includes common items, such as televisions and large appliances. This includes things like the refrigerator, range, washer and dryer. Ideally, they should be properly disconnected by an authorized service man prepared for transport. You should defrost, clean and dry your refrigerator and freezer long enough before the move for them to no long be cold. Thoroughly clean your cooled grilled. Realize this is a big job and schedule it well ahead of moving day. Dispose of used briquettes. You should probably give away any unused, new charcoal briquettes as this is a fire hazard and not something that should be moved with your household goods. Wrap grates in newspaper or packing paper and box up. If appropriate, tape your grill shut for the move. This would include things like DVD players, CD players, gaming systems, televisions, home theaters and turntables. If you still have the original box and packing materials that they came in, it is best to repack them in their original packing materials. If not, we recommend that you leave this task up Artisan Movers in order to best protect these valuable, fragile items that are such an important part of life these days for many people. This would include things like DVDs, CDs, records, audio cassette tapes and game cartridges. Ideally, they should be packed in the original protective casing they came with, then wrapped in tissue paper for additional protection. Please keep in mind that these items can be damaged by long-term storage in areas that lack environmental controls, such as the garage or a low cost rented storeroom. These should be one of the last things you pack and one of the first things you unpack. Boxes should be marked Fragile. You should remove all fragile, small parts such as the bulbs, harps, and shades. The electric cord should be rolled up and secured, such as with a zip-tie. Many people find it works well to pack smaller lamps in with bedding, like large comforters. Alternately, you can wrap each one and place it upright individually in its own box. Then fill in the gaps with corrugated paper, packing paper, packing peanuts or similar. The small parts, like the harp and finial, are easiest to keep track of if they are packed in the same box with their matching shade. Do not use newspaper to wrap shades as it can leave permanent marks. Lamp shades can take essentially an entire box to themselves. Although you can buy special boxes for this, we recommend that you leave the disassembly, packing and reassembly of your beds to us at Artisan Movers. With such a large, expensive item that is so critical to your well being, it makes no sense to take chances on damaging it in transit by doing it yourself and potentially hurting yourself as well in the process. Remove loose parts, such as the carousel. Wrap and pack these parts like any other fragile kitchen items, such as dishware. For Safety purposes, tape the door shut using an X-pattern. As with electronics, it is best to pack in its original box and packing materials, if available. Otherwise, pack similar to a small appliance or computer. You may need specially created crates for properly packing such items. If they are valuable, you shouldn’t attempt to pack or move them yourself. For smaller items of this sort, it is fine to follow common sense and pack them similar to any small, fragile item, like dishware. Do not ever use newspaper for packing such items. It can leave permanent marks, ruining your artwork. This includes PCs, scanners, printers and other accessories. If available, pack them their original boxes. If not, we recommend using strong, corrugated boxes shored up with extra padding inside of the bottom box. The items should be wrapped with a blanket or protective pad before being placed in the box. Then fill in any gaps with packing materials, such as Styrofoam peanuts. Detachable cords should be carefully labeled and packed separately. Wrap each item in low-sulfur paper or cloth to prevent tarnishing. If there is a silver chest to go with it, it should be wrapped in a blanket or moving bad. Tools are typically heavy and should be packed in the smallest boxes possible. If they are currently being stored in a tool case, it is best to stuff it with packing paper or other padding and lock it. Any power tools that use flammable substances such as oil or gasoline must be drained before being packed. It is not safe to move them while they still contain oil or gasoline. This can include collectible cars, motorcycles and ATVs. You should drain most of the fuel and disconnect the battery. If it is a vehicle that uses antifreeze, make sure it has sufficient antifreeze. A good rule of thumb: If it is valuable or hard to replace and you are stumped, call in the professionals. We at Artisan Movers are happy to help with any of your moving needs. We cannot pack or move these items for you. Grandfather Clocks: These should be prepared and moved by a qualified service provider. Hot Tubs: Like hot tubs, these need to be prepared and moved by a qualified service provider (in the correct specialty, obviously). Handguns and Ammunition: You must pack and move such items personally. Medication: Drugs should be carried with you personally. Speak to your pharmacist if you are on drugs requiring unusual care, such as refrigeration. Flammable or Combustible Items: This includes things like spare gasoline cans, propane tanks (even empty ones) and oil. We cannot move these for you. Use them up or otherwise dispose of them properly prior to your move. Food: Perishable food cannot be packed and moved. Although canned goods and non-perishable items can be packed, we do not recommend it. For a local move, food can be moved by car.